There can be no tolerance for Nazi-like language: bigots must be shown the door. On Sunday, the Sun published a column that, even by their standards of dog-whistle politics, was beyond the pale. This was rhetoric that directly brings to mind talk of ‘The Jewish Problem’. Indeed, both Muslim and Jewish organisations made that very point. And the backlash was rightfully significant. Kavanagh poses no peaceful answer in his article. He simply ends with that dark question. It’s important to remember the Sun’s track record when it comes to this. As the letter points out, in October last year, the paper published a piece by Kelvin MacKenzie which attacked Channel 4 presenter Fatima Manji for wearing a headscarf. He called it ‘massively provocative’. 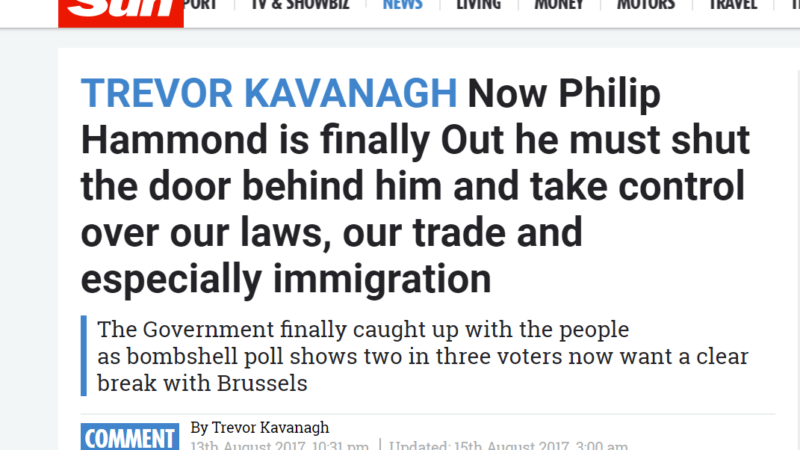 ‘Provocative’ is one word you might use to describe the paper’s article after the EU vote: “Where the Brex was won: Streets full of Polish shops, kids not speaking English…but Union Jacks now flying high again.” The paper were forced to pull the article, following a rise in hate crime. Shockingly, IPSO cleared the paper of wrongdoing in the Channel 4 case. Were they to let off the paper this time, faith left in the watchdog might disappear entirely. But perhaps that’s because IPSO’s Editors’ Code is so weak on racism: it only prohibits: “prejudicial or pejorative reference to an individual’s race” [my italics] – rather than racism against a whole group, as racism so often is. The point however is this: there can be no excuse for language that hints at ‘solutions’ to entire groups of people. That is the language of lynching, the rhetoric of racist mobs. Now, the Sun must pull the piece – and put a stop to racism in the UK’s largest newspaper. In a week of fascist violence in the US, there can be zero tolerance for hinting at ‘final solutions’. Kavanagh must go.